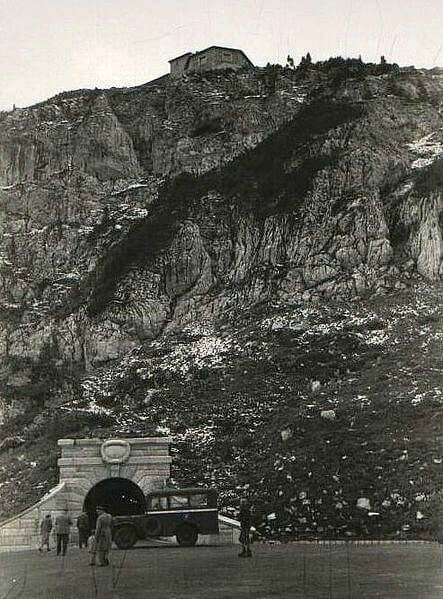 History of Hitler's Eagle's Nest, the Kehlsteinhaus. 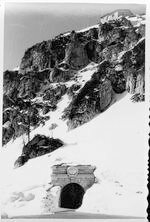 The creation of Hitler's Eagle's Nest was a remarkable engineering success, a battle against time, snow, and rugged terrain. Martin Bormann was known for his massive building program on the Obersalzberg below, but this enormously difficult project was colossal, even for him. And this creation had an important deadline: Hitler's 50th birthday on April 20, 1939. The project began in April of 1937. The gift of this conference center (later called Hitler's Eagles Nest by the Allies) was to be from the Nazi Party which supplied the funds, along with some donations. Construction of the building on top of a mountain, with its steep access road and a 400 foot elevator shaft inside the mountain, was an ambitious goal, but consistent with the Third Reich's grandiose building plans. Over 3,000 men worked day and night, winter and summer, for 13 months to complete the project. 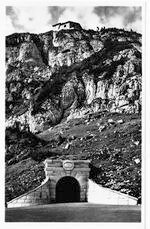 The road was blasted out of the mountainside, passing through five tunnels to get to the entrance. Heavy wooden gates guarded the opening into the Kelhstein, leading into a 406 foot (124 meter) tunnel cut into the heart of the mountain. An elevator shaft the same length as the tunnel was then cut straight up through the mountain to the peak itself. The house sits on the summit, at 6,017 feet (1834 meters). This photo was taken by U.S. soldier shortly after the occupation of Berchtesgaden. No slave laborers were used in the construction; most of the workers were highly paid Germans, Austrians and Italians. The work was very dangerous; men working on the scaffolding on the Eagle's Nest were dangling over a 2,000 foot drop! 12 men died during the project. Even though there was a cable system to haul material to the top, a lot of the supplies were still carried up by a constant stream of men with 110 pound (50 kg) loads on their backs. The entire project was completed by the summer of 1938, well in advance of Hitler's birthday the following year. The name Hitler's "Eagle's Nest" came from a description of the place given by the French ambassador in 1938. 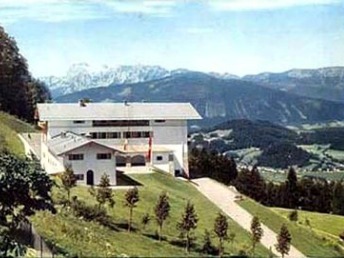 The Germans called it the "D-House" (for diplomatic) or the Kehlsteinhaus, from its location on the Kehlstein mountain. 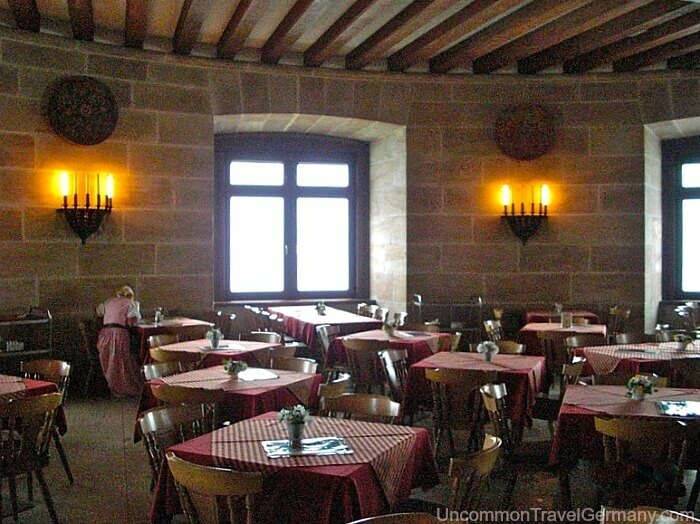 Hitler's Eagles' Nest was used primarily to entertain visiting dignitaries. This was not where Hitler lived when he was in Berchtesgaden. In fact, Hitler only made about seventeen trips to this mountain eyrie. The Führer lived further down, in his Alpine mansion, the Berghof, on the Obersalzberg above Berchtesgaden. 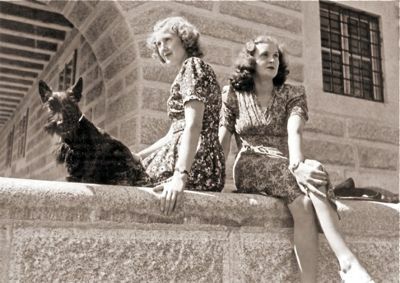 Eva Braun spent far more time here, entertaining her friends and family. 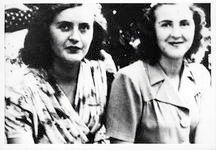 One of the social events that took place in Hitler's Eagle's Nest was a party following the wedding of Eva Braun's sister, Gretl, on June 3, 1944, to SS Obergruppenführer Hermann Fegelein. 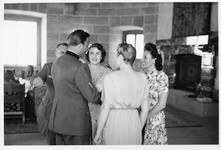 Hitler wasn't present at the party at the Kehlsteinhaus or the wedding, but he did attend the reception at the Berghof. 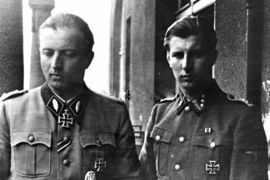 This was the unfortunate officer who was executed for desertion, on Hitler's orders, just days before the fall of Berlin. 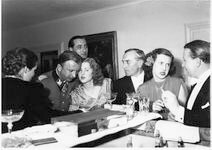 The SS found Fegelein drunk in his Berlin apartment, in civilian clothes, with another woman, a large amount of money, and a Swiss passport. Looking at the photos of the conference room, other than the furniture, the room looks pretty much the same then as it does now. 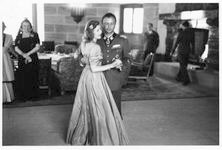 Left photo, above: Gretl is on the far left, dancing with Waldemar Fegelein, the grooms's brother. 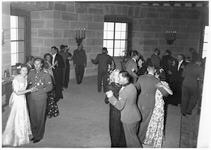 Right photo, above: Eva Braun is dancing with Hermann Fegelein (Mussolini's fireplace in background). Left photo, above: Fegelein talking to Eva Braun, on left, possibly at the Berghof reception. Right photo, above: Fegelein with guests at Eagle's Nest, Gretl facing the camera. 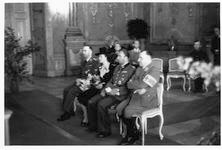 The wedding was held in Salzburg; Heinrich Himmler and Martin Bormann attended. Left photo, above: Gretl and Hermann Fegelein during the wedding, flanked by Himmler and Bormann. 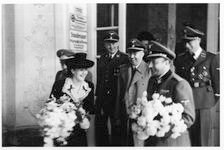 Right photo, above: Gretl and Fegelein after the ceremony, Himmler in back with light-colored coat. 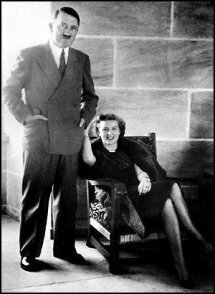 In addition to visiting VIP's, members of Hitler's inner circle sometimes paid a visit. 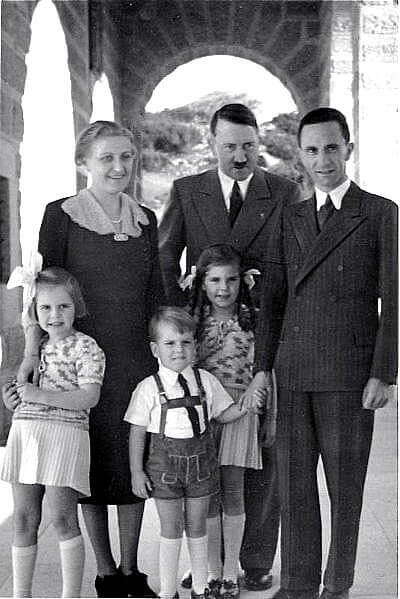 The photo above shows Joseph and Magda Goebbels on the sun porch at the Kehlsteinhaus, with their three eldest children, Hilde, Helmut and Helga. This relic of the Third Reich barely survived. It was deliberately (according to some sources) excluded from the massive bombing attack on the Berghof and Obersalzberg that occurred during the last weeks of the war. After the war, Hitler's Eagles Nest was going to be razed like many of the other Berchtesgaden area buildings with Nazi associations. Bavarian District President Jakob intervened to save it and now it is one of the few local buildings from the Nazi period that still remain and can be viewed in more or less its original condition. 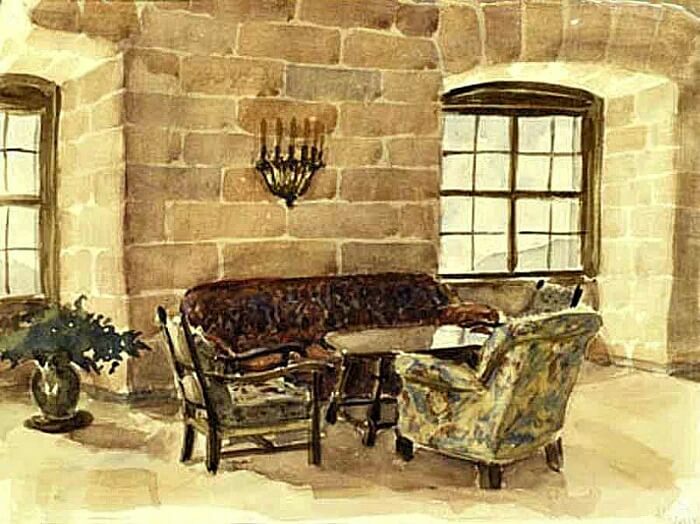 It is interesting to compare a current photo of the reception room with a watercolor of the same room done by Hitler himself. The window glass is a little different, but the wall sconces look the same. To see a great collection of "then and now" photos of the Eagle's Nest, take a look at thirdreichruins.com. The Eagle's Nest is open to the public from mid May until the end of October. The snow determines the opening and closing dates; the steep road up there has to be clear of snow for the buses to run. See my page on visiting the Eagle's Nest for more info about what you'll see up there. You can get up to the Eagle's Nest on your own, via the bus system, or you can take a tour that takes you up there. Getting there on your own. 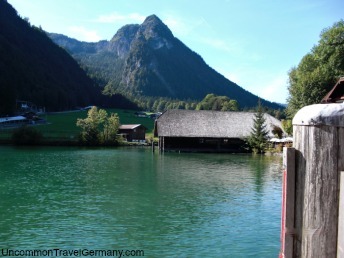 In short, it involves getting to Berchtesgaden, then taking a local bus up to the Obersalzberg. 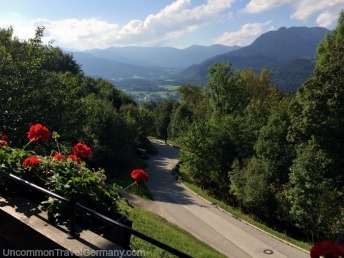 Once you're on the Obersalzberg, they have special buses that take you up the mountain road to the Eagle's Nest elevator. I've described the steps in detail, and which buses to take, at getting to the Eagle's Nest. If you'd rather someone else make the arrangements, and add information about sights you'll be seeing, there are several popular tours that include the Eagle's Nest. There are guided tours to the Eagle's Nest that leave from Munich, Salzburg and Berchtesgaden. From Munich. 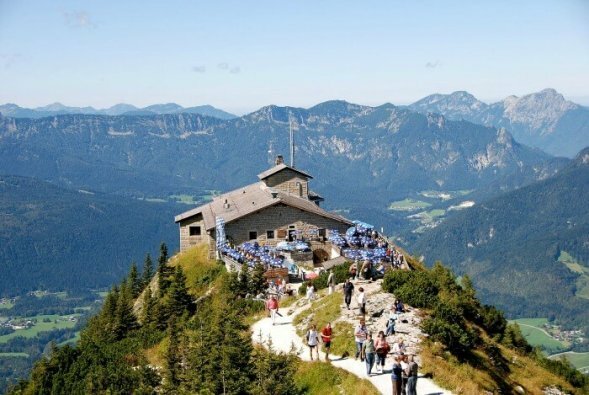 This is an all-day, guided bus tour from Munich that takes you to the Eagle's Nest, and also into the Dokumentation Center museum on the Obersalzberg to explore the underground bunkers, and into the town of Berchtesgaden for lunch. 10 hours, $61.69. In winter, when the Eagle's Nest is closed, they substitute a visit to the Salt Mines in Berchtesgaden. See Munich Eagle's Nest tour for more info and booking. From Salzburg: this popular, half-day, guided tour takes you from Salzburg to visit the Eagle's Nest, driving through some beautiful alpine scenery, then a stop for lunch in the pretty town of Berchtesgaden. 4.5 hours, $66.87. See Salzburg to Eagle's Nest tour for more info and booking. Another tour from Salzburg. This all-day, guided tour packs in a lot of great stuff. In addition to visiting the Eagle's Nest, they take you to the Obersalzberg where you can see the ruins of Hitler's house, the Berghof, and the creepy bunkers next door under the Hotel zum Turken. The guide also takes you to explore the town of Berchtesgaden, then on to see the charming Ramsau church, followed by a stroll around a little alpine lake, the Hintersee. 8 hours, $112.60. Hotel pickup in Salzburg. 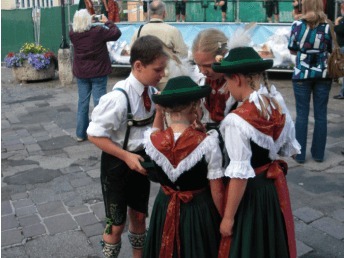 See Salzburg, Eagle's Nest, Ramsau tour for more info and booking. A great local tour to the Eagle's Nest leaves from Berchtesgaden, given by eagles-nest-tours.com. It's a 4-hour, guided tour which includes a tour of the Dokumentation Center and its bunkers on the Obersalzberg, in addition to the trip up to the Eagle's Nest and a tour of the building. I've been on this tour and highly recommend it. Euro 55.